Canada’s Agriculture Day is a time to showcase all of the amazing things happening in our industry and create a closer connection with consumers about where their food comes from and the people who produce it. ” We are proud to be part of a major economic industry, because more than 2 million Canadians work in agriculture. Le Petit Mas employs more than 50 people in high season. We are proud to be part of the 97% of Canadian family-owned farm. We are proud to protect the environment, we grow organic garlic in Quebec for 25 years. We are proud to be innovative, as we are both farmers with university background. Also, our fermented garlic scape is a unique Canadian product. We are proud to offer quality Canadian garlic.Canada ranks number one in global food safety. Since 2017, it is now possible to track down our garlic from our field to our points of sales because we implement a traceability system to get the Canada Gap certification. We are proud to work in an agriculture business. Agriculture is not only work, it’s a lifestyle. A lifestyle where kids play in mud, where days end at sunset (or after…) and where we have the satisfaction to be part of a better world a bite at a time. You didn’t make your garlic stock for the year? Don’t miss the next harvest! Subscribe to our newsletter. Meanwhile, discover our fermented garlic scapes, a unique product offered in more than 500 points of sales through Quebec, Ontario and Calgary! 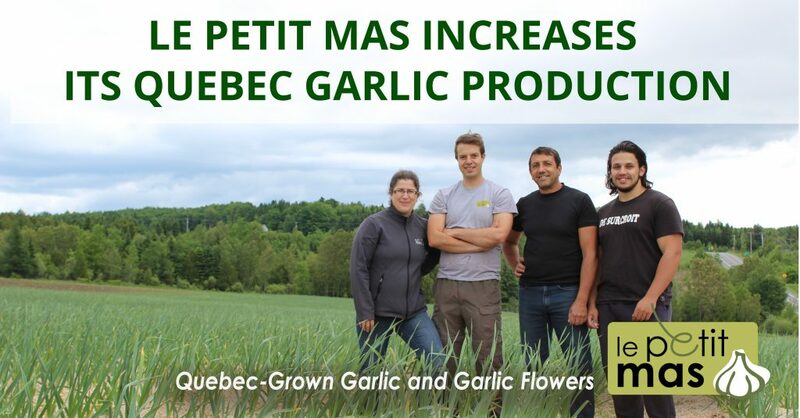 June 13, 2016 – Le Petit Mas has invested close to one million dollars in Martinville, in the Eastern Townships, in order to expand and develop its agribusiness of Quebec garlic and fermented garlic scapes in oil. Marie-Pierre Dubeau and Sébastien Grandmont acquired the Petit Mas family farm in 2013. This young couple from Sherbrooke aimed to increase the garlic production for the Quebec market and to set up the family home on their farmland. After a three-year search, they found the ideal land in Martinville, in the fertile Coaticook River Valley, at the heart of the Eastern Townships. To bring their projects to fruition, they partnered with new business associates Jean-Raymond Payet and Carole Begue. “They had wonderful land and the desire to grow garlic. Instead of becoming competitors, we decided to become associate partners,” co-owner Marie?Pierre Dubeau stated. The new processing and storage buildings needed to accommodate the twofold increase in production will be ready by spring 2017. “In the new building, we will have space for our administrative office and a farm store, two new features for our business,” Marie-Pierre Dubeau explained. In the meantime, for the 2016 harvest, you can still pick up your order of Quebec garlic at the farm (by appointment only, 819 849-0564), order it online (www.lepetitmas.ca/online-store) as of July 26, or buy it at the IGA or Métro in September, as Le Petit Mas is one of their Quebec garlic suppliers. The expansion to the new land will be gradual as it takes several years to meet organic certification standards. Therefore, over the next few years, Le Petit Mas will cultivate organic garlic on land that is already certified, while also working to convert an additional 8 hectares of land to organic farming by 2018. Le Petit Mas is well known for its unique seasoning, fermented garlic scapes in oil, now available in over 500 points of sale in Quebec. Fermented garlic scapes are part of the same food trend as tempeh1 and kombucha2. It keeps the product alive and good for your health, thanks to the lactic bacteria and enzymes produced, as well as maintaining the concentration of vitamins, nutrients, and bioactive molecules of raw foods. 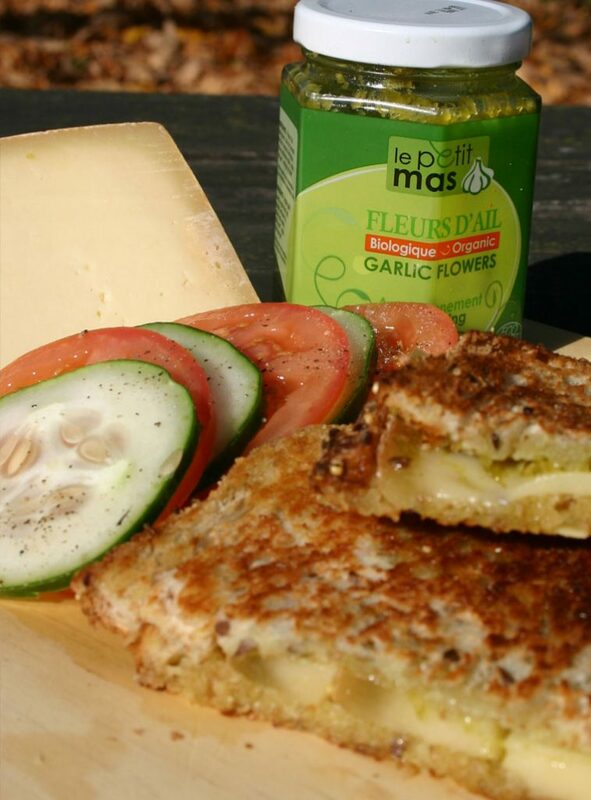 It preserves the scapes for several years through entirely natural means without chemical additives or pasteurization. 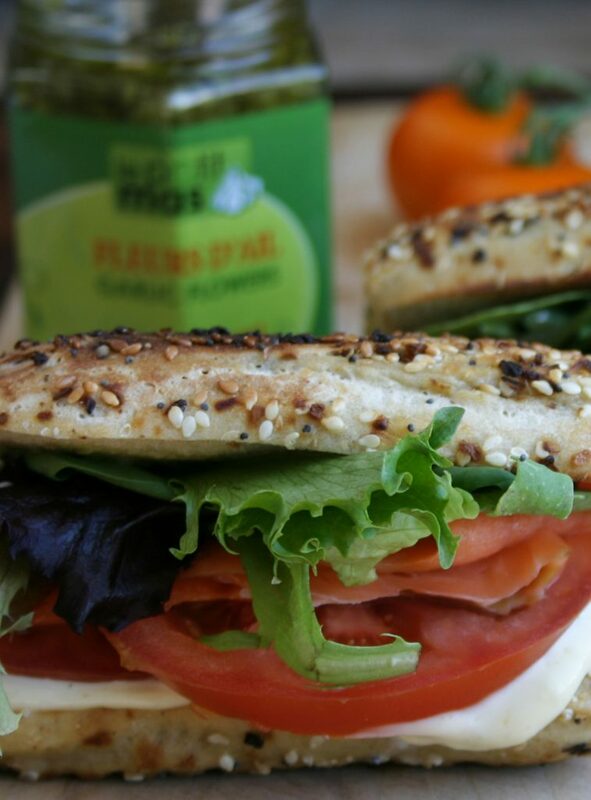 It creates new flavours thanks to the lactic and organic acids produced. 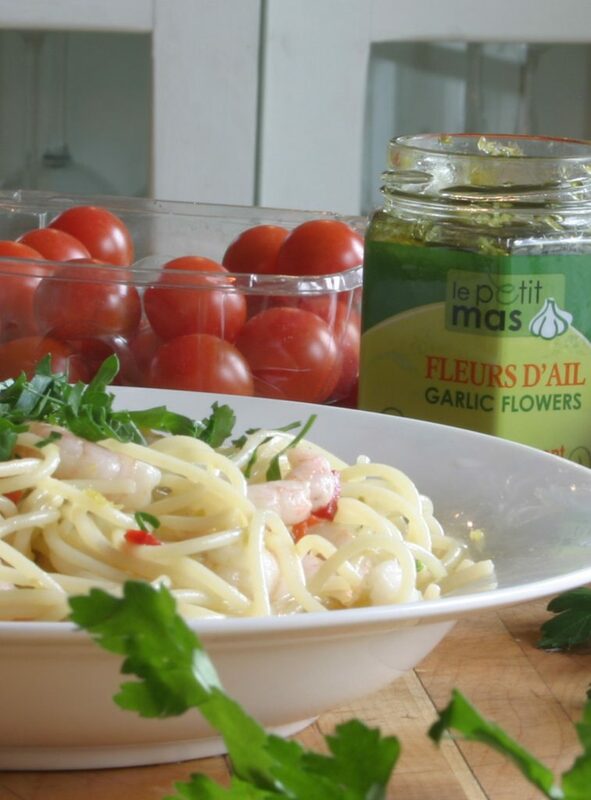 Le Petit Mas retains a dozen (full-time and part-time) employees year-round and two dozen seasonal employees to produce 35 tons of Quebec garlic and 23 tons of fermented garlic scapes. The Coaticook River Valley can thus take pride in providing a home for a leading Quebec agribusiness of organic garlic. Kombucha is a drink prepared from a symbiotic colony of bacteria and yeast.